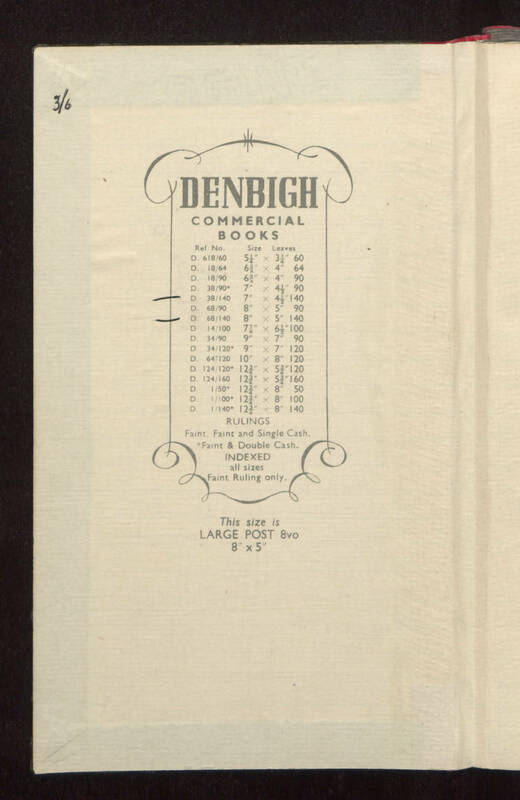 [handwritten] 3/6 [stamp] DENBIGH COMMERCIAL BOOKS Ref. No. Size Leaves D. 618/60 5 1/4" x 3 1/4" 60 D. 18/64 6 3/8" x 4" 64 D. 18/90 6 3/8" x 4" 90 D. 38/90 7" x 4 1/2" 90 D. 38/140 7" x 4 1/2" 140 D. 68/90 8" x 5" 90 D. 68/140 8" x 5" 140 D. 14/100 7 7/8" x 6 1/2 " 100 D. 34/90 9" x 7" 90 D. 34/120* 9" x 7" 120 D. 64/120 10" x 8" 120 D. 124/120* 12 3/4" x 5 3/4" 120 D. 124/160 12 3/4" x 5 3/4" 160 D. 1/50* 12 3/4" x 8" 50 D. 1/100* 12 3/4" x 8" 100 D. 1/40* 12 3/4" x 8" 140 RULINGS Faint, Faint and Single Cash, *Faint & Double Cash INDEXED all sizes Faint Ruling only. This size is LARGE POST 8vo 8" x 5"